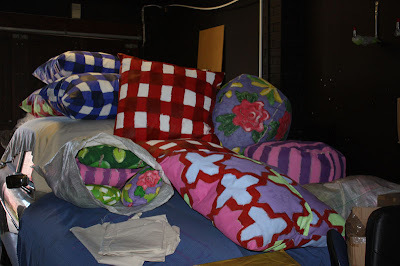 Here is a picture of where we are keeping the actual pillows for the title sequence for Driver Dan's Story Train. In the garage on top of the classic Volvo. These pillows have also been to Abu Dhabi for when the Arabic version of the show was filmed. Each one was made by Miss Rebecca. I helped on one of the pillows, I wanted to join in and Miss Rebecca let me.